How Does Your Bedroom Treat You? Eight hours of sleep is what most people think of when you hear the saying ‘a good night’s rest’. I have heard my whole life that’s how much sleep you should get if you want to be healthy. Of course, I have been around people who claim they need less or more. Scientists, however, have been studying the effects of sleep deprivation for decades and there are a plethora of negative things that can happen if you aren’t resting enough in your bedroom. So, we have established that getting enough hours of rest is an important thing. Another thing to consider is the quality of sleep that you get when you lay down. You may be getting all the hours in that you feel, but for some strange reason, that snooze button on the alarm has become your best friend, lately. This habit could mean you may not be properly going through your sleep cycles. There are four cycles of sleep. In the first stage, you can be awakened easily and most people, if roused, will claim they weren’t even asleep. The second stage involves a deeper sleep where your brain activity is continuing to slow. In this stage, most people are harder to wake up. Phase three is referred to as deep Non-Rapid Eye Movement (NREM) sleep, and it is difficult to awaken people from this stage. This stage is the most restorative one, but it is also the time where people are most likely to sleepwalk or have night terrors. Last is the Rapid Eye Movement (REM) stage. Referred to as the dreaming stage, your brain is more active than in the second and third stages. You can are easier to awaken during REM and it can leave you feeling groggy. When you sleep, you will cycle through all these stages every 90-110 minutes. What does the Bedroom Have to Do with It? Even though you are sleeping, your body can respond to outside stimuli. This notion means light, noise, smells and other things can affect you. You may fall asleep with the light on, but chances are you will not get proper rest. The same can be said for a noisy bed if every time you move, it thumps, squeaks, and bumps. You want to have a quiet, dark, and comfortable bedroom to sleep. While a mattress is essential for comfort, the bed that holds it is just as important. Making sure you have a sturdy bed frame that fits your style and a bedroom set to match can help with the overall quality of your sleep. A bedroom is a special place in the home and we understand that it requires a special touch. 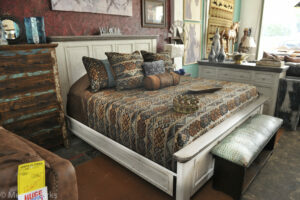 If you are looking to replace your bed, Santa Fe Terra can help you find the perfect one for your bedroom. Our staff will aid you in making sure the comfort of your bed is top notch. Come and see our selection and take yourself one step closer to better sleep!